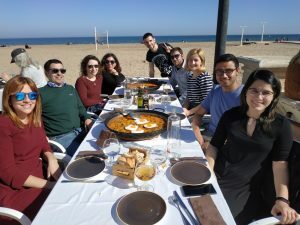 Miguel´s farewell dinner Group meetings, 2018. 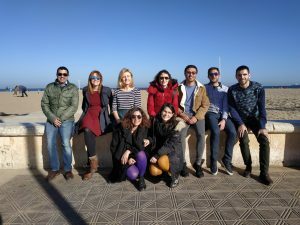 Next seminars: Sergio (Apr25), Camilo (May9), María (May23), Klaudia (Jun6), Fran (Jun20), Judit (Jul4), Rossella (Jul18). Klaudia Kapłońska, master thesis student. Judit Oliver Meseguer, Ph.D, senior post-doc . Rosa Adam Ortiz, Ph. D, Post-doc. Silvia González Merino, Master thesis student. Bethany Ross, Degree thesis student. Finn Blake, Degree thesis student. Jaume Rostoll, Degree thesis student. Nieves González García, Master thesis student. Judit Oliver Meseguer, Ph. D.
Paula Rubio Marqués, Ph. D.
Vicent Borràs del Llano, Degree thesis student. Clàudia Canós Giménez, Degree thesis student. Virginia Mainar Ruiz, Degree thesis student. Jose Ramón Cabrero Antonino, Ph. D.